In addition to our staples, we always try out new recipes for Thanksgiving. This year, Little Miss made a bacon cheddar sweet potato casserole recipe from her mom and Bjorn made a butternut squash bisque from a recipe published in the New York Times. Cook and mash sweet potatoes (however many you want). I like to bake them, then peel after they’ve cooled slightly, but you can also peel and cube them first and either boil or steam them. While those are cooking, cut bacon into 1/2″ pieces and saute until crispy. How much? However much you think you want, plus two. Mix copious amounts of butter and grated cheddar cheese into the mashed potatoes – I like sharp cheddar, but it works with any kind. Mix in bacon. Salt and pepper to taste – remember, they’re potatoes, and can handle lots of seasoning. Butter an appropriately-sized baking dish, then plop in the bacony cheesy potato mix. Top with a little extra grated cheese if you want. Bake at 350 degrees for 20 minutes or so, or until cheese is melty and the top is starting to get brown. While they are baking, get a prescription for Lipitor, because you will probably eat more than you should. In a large saucepan set over medium heat, melt the butter until it foams. Add the squash, fennel, ginger and garlic and cook slowly until soft, about 15 minutes. Sprinkle in the flour and stir, then cook for 5 or 6 minutes to incorporate. Add the vermouth and cognac to deglaze the first pan, and reduce the liquids until the pan is almost dry. Add the tomato juice and reduce it by half, approximately 3 minutes. Add the stock, anise and cardamom (we did not have anise or cardamom so we skipped it) and simmer until reduced by roughly half, about 30 minutes. When the bisque has reduced, remove from heat and stir in the tarragon. Cover and steep for 5 minutes. Whisk in the crème fraîche, then strain bisque through a fine-meshed sieve or chinois. Season with salt, lime juice and cayenne. Serve immediately with a crisp bacon bits or in our case, homemade croutons. Although I do not condone vegetarianism, vegetables can be prepared in a way where I don’t miss the meat! For a recent party, we visited the farmer’s market where we picked up some delicious early girl tomatoes, cucumbers, squash blossoms, and baby squash. 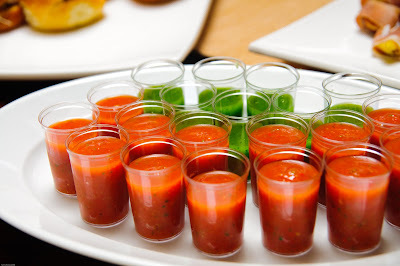 Yuan busted out his immersion blender and made delicious gazpacho and cucumber soup which we served as individual shots. 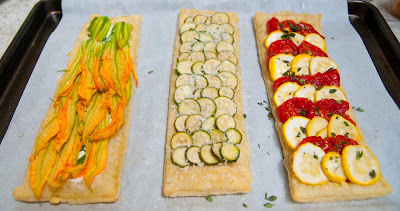 We also experimented with puff pastry and made these veggie tarts. We used the squash blossoms fresh but roasted the squash and tomatoes before assembling the tarts. Goat cheese was used as a glue and we sprinkled with fresh thyme and parmesan cheese before popping them in the oven for about 15 min. When the temps top a hundred in the central valley, the last thing I want to do is turn the stove on so we have been grilling a lot these last few months. 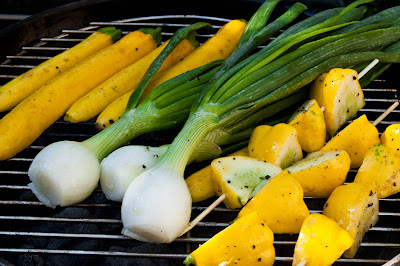 Grilling is great because you can throw salt, pepper and olive oil on pretty much anything, grill it, squeeze some lemon on it and it’s absolutely delicious. 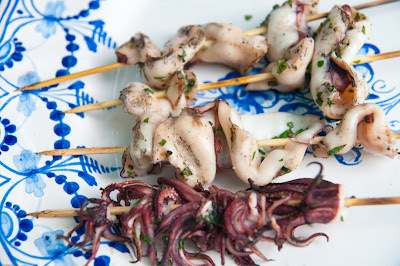 Yuan came out a couple weeks ago and we had some squidly kabobs. Call it laziness, call it preoccupation…we prefer to call it summer vacation. Yes loyal readers, all four of you (hi mom), we are back! Or at least we’re going to try to be…It’s August here in the greater bay area, which means Yuan and Little Miss are shrouded in fog and probably developing vitamin D deficiencies, while the Princess is roasting to a crisp in the scorching Central Valley. Thankfully we have great friends in Berkeley who let us take over their house and yard in exchange for grillables and a little manual labor in the garden!